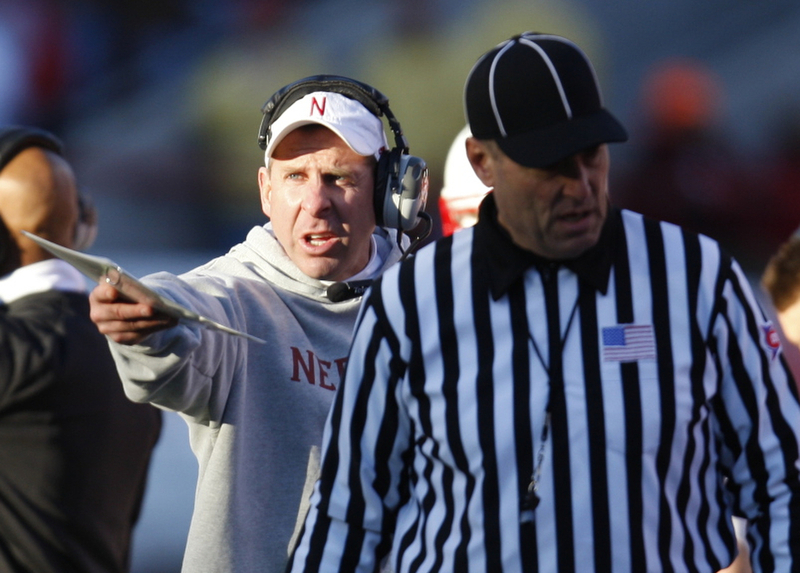 Did Pelini make a promise, or a joke, to Navy seaman? As if the 19-7 loss in the Holiday Bowl weren’t bad enough, now Huskers Coach Bo Pelini is catching hell from Fox Sports for reneging on a promise they say he made to a U.S. Navy seaman from Nebraska that he could call one play during the bowl game. According to Fox, Pelini one-upped the Washington Huskies coach by giving seaman Morgan Ryan of Minden, Neb., a field pass and jersey — and a promise to let him call one play in the bowl game. Ryan, a loyal Husker, was ecstatic at this gift before a seven-month deployment at sea. Now he’s getting ripped on national sports shows. Pelini’s temper is quickly becoming as much of a story as the precociousness of his quarterback or the return of the program to national prominence. It’s interesting to see the difference in the way the story is being reported. In the Lincoln Journal Star, the reporter ledes off with the Husker Athletic Department’s take on the situation — that Pelini was speaking in a “light-hearted manner” and joking. He also describes Pelini as “mild-mannered” when he answered the Fox reporter’s question. But the Fox news the story paints it as though everybody thought Pelini was serious, and that Pelini “barked” at her when she asked about it at the press conference. Guess we’d have to see video of the press conference to see for ourselves how he acted. Could there have been better communication? Yes. Is she hyperbolizing just a LITTLE bit? Yes. Good grief, if I were Seaman Morgan id be more pissed that she used me and my uniform to angle a cheap story. He also didn’t ask when he was there. Incidentally, do you write anything happy, or are all your pieces written from the point of view of somebody’s failing? Reporting isn’t just writing hit pieces. My mistake, Petty Officer Morgan. CS — Since you obviously haven’t been reading faithfully, here are a few for ya: Sally Gordon makes the Today Show, bookstore owner voted Person of the Year; Sunken Gardens is decked out for the holidays, flash mobs in Lincoln and plenty of straight news, such as who’s running for what… I could go on… or you could reach the archives. I guess I don’t look at stories as being positive or negative — I look for newsworthiness. You do a fine job. No trouble with your attitude. Just know this is Red country and we LOVE T.O..AND HIS COACHES. As for you I am attracted to all your stories,.Thank You!!!! I have read those. I guess my point is that whenever you write a story that isn’t ‘sidebar’ material your overall tone is always that someone messed up, someone was hiding something, someone didn’t want the rest of Lincoln to know, and here you are bringing it to the forefront in your little ol blog take THAT, LJS. I also fail, I guess, to see what this being ‘Red’ or ‘Blue’ country has to do with anything, Dave. In MY journalism classes I was taught to try to avoid bias as much as possible and to not emphasize only one side of a story. If that is the kind of news you like there is no shortage of it. That type of reporting is cheap and easy, and requires little in the way of backing itself up-those writers can always say its just ‘entertainment’. CS , Stay in school or get your own blog or better yet why even be here. Read the LJS and let them feed you your opinions.